At WoodWing´s Xperience conference taking place in Lisbon from June 17-18, CoDesCo IT Consulting, a German developer of IT solutions for publishing and communications, introduced Smart Translation Solution for WoodWing´s multi-channel publishing system Enterprise and its editorial management application Content Station. The solution enables publishers, agencies and marketing departments to ease their multilingual publishing processes. It allows the localization of documents any kind directly from within Content Station, supports the XLIFF format and is compatible with all major translation memory systems including SDL Trados. More information is available at www.smart-translation-solution.com. Hamburg, June 13, 2014 – In today’s global business world, offering professional localized publications and communication materials become even more important. At the same time, the translation of customer magazines, catalogs, books, annual reports, manuals, marketing materials, and more in various languages is still a very time-consuming, complex and error-prone process. Users of WoodWing Enterprise, WoodWing´s multi-channel publishing system for Adobe InDesign, can now significantly increase the efficiency of their translation processes. Unlike other translation solutions for Adobe InDesign and InCopy, which always process the entire document for translation, Smart Translation Solution supports the translation of individual articles in the Enterprise publishing system – considerably simplifying the process and a significant efficiency increase. The functionality of the Smart Translation Solution integrates seamlessly into the WoodWing Enterprise workflow. Users will not notice that they are working with a third-party-solution. The solution avoids the annoying task to create all components of an article again for each target language. When new translation jobs are created in Content Station, the translator assigned to this job is automatically notified by e-mail. Smart Translation Solution uses XLIFF (XML Localization Interchange File Format), the standard in the translation industry. In addition, the solution works with all major TMS (translation memory systems) such as SDL Trados, memoQ, Across, and more. Translators can use Content Station to access their translation jobs offline and online and export/import XLIFF files to and from their preferred translation memory system. 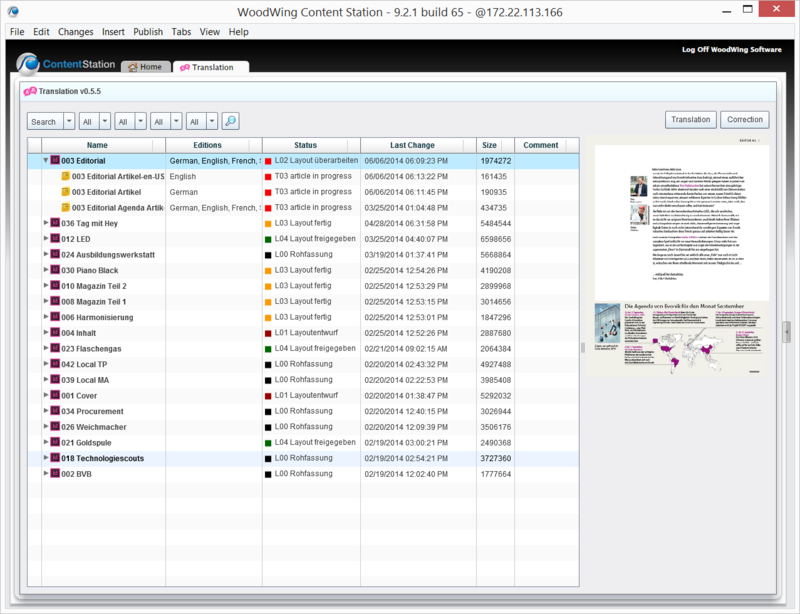 An optional module for Content Station enables translators to do the job completely within Content Station. This approach also adds to the security of sensible data as in this procedure the translation file never leaves WoodWing Enterprise. Smart Translation Solution preserves all text formatting within a translation job during translation and re-import into InDesign. As a result, there is no manual post processing required after translation. The solution is distributed worldwide by Impressed, a Hamburg-based distributor of professional publishing solutions. For more than 20 years, CoDesCo IT Consulting, Oststeinbek near Hamburg (Germany) is known as an international expert in the development, system integration, consulting and distribution of publishing software solutions. This experience and the comprehensive product portfolio are keys for the long-term success of the company. The team of publishing and IT experts is the best choice for publishers, agencies and marketing departments looking to optimize modules of an existing publishing solution or are in need to implement an entire publishing system. More information is available at www.codesco.com/en.